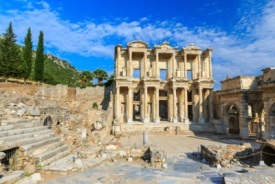 Ephesus was the capital of Asia Minor during the time of the Roman Empire, and now it is one of the world's most impressive and best-restored archaeological sites. Walk the marble-paved streets and see the spectacular ruins of the Temple of Hadrian, the Library of Celsus, the house where the Virgin Mary spent her last days and the amphitheater where St. Paul once preached. Kusadasi is a Turkish resort known for its extensive marina and miles of beaches, but it is famed for the ancient treasures just minutes away: Miletus and its Greco-Roman theater and Temple of Athena, Didyma and its Temple of Apollo, and the most glorious of all, the marble city of Ephesus.